This recipe is typical of Northern style cornbread. Hope you enjoy. Adjust oven rack to center position and heat oven to 425 degrees F. Grease bottom and sides of a 9-inch square metal pan. Whisk cornmeal, flour, baking powder, baking soda, sugar, and salt together in large bowl. Add eggs and milk. Stir ingredients until almost combined. Add melted butter; stir until ingredients are just combined. Pour batter into prepared pan. Bake until top is golden brown and lightly cracked and edges have pulled away from side of pan, about 25 minutes. Transfer pan to wire rack to cool slightly, 5 to 10 minutes. 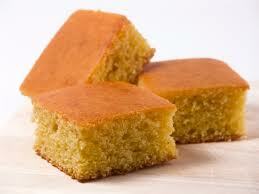 Cut cornbread into 3-inch squares and serve warm.